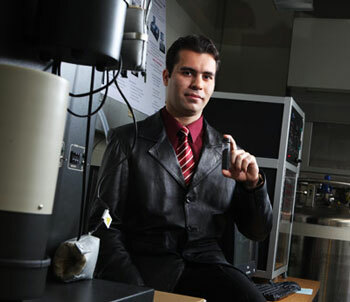 (Nanowerk News) Determined to play a key role in solving global dependency on fossil fuels, Javad Rafiee, a doctoral student in the Department of Mechanical, Aerospace, and Nuclear Engineering at Rensselaer Polytechnic Institute, has developed a new method for storing hydrogen at room temperature. Rafiee has created a novel form of engineered graphene that exhibits hydrogen storing capacity far exceeding any other known material. For this innovation, which brings the world a step closer to realizing the widespread adoption of clean, abundant hydrogen as a fuel for transportation vehicles, Rafiee is the winner of the 2010 $30,000 Lemelson-MIT Rensselaer Student Prize. He is among the four 2010 $30,000 Lemelson-MIT Collegiate Student Prize winners announced today. Lemelson-MIT Rensselaer Student Prize-Winner Javad Rafiee. Rafiee is the fourth recipient of the Lemelson-MIT Rensselaer Student Prize. The prize, first given in 2007, is awarded annually to a Rensselaer senior or graduate student who has created or improved a product or process, applied a technology in a new way, redesigned a system, or demonstrated remarkable inventiveness in other ways. "This year’s winners from the Massachusetts Institute of Technology, California Institute of Technology, Rensselaer Polytechnic Institute, and University of Illinois at Urbana-Champaign shine light on the significance of collegiate invention. They have the ability to transform seemingly implausible ideas into reality and are the true entrepreneurial leaders of their generation,” said Joshua Schuler, executive director of the Lemelson-MIT Program. For videos and photos of the winner and award finalists, as well as a Webcast of the announcement ceremony, please visit: www.eng.rpi.edu/lemelson. Hydrogen storage has proven to be a significant bottleneck to the advancement and proliferation of fuel cell and hydrogen technologies in cars, trucks, and other applications. Rafiee has developed a new method for manufacturing and using graphene, an atom-thick sheet of carbon atoms arranged like a nanoscale chain-link fence, to store hydrogen. His solution is inexpensive and easy to produce. With adviser and Rensselaer Professor Nikhil Koratkar, Rafiee used a combination of mechanical grinding, plasma treatment, and annealing to engineer the atomic structure of graphene to maximize its hydrogen storage capacity. This new graphene has exhibited a hydrogen storage capacity of 14 percent by weight at room temperature – far exceeding any other known material. This 14-percent capacity surpasses the U.S. Department of Energy 2015 target of realizing a material with hydrogen storage capacity of 9 percent by weight at room temperature. Rafiee said his graphene is also one of the first known materials to surpass the Department of Energy’s 2010 target of 6 percent. Rafiee’s graphene exhibits three critical attributes that result in its unique hydrogen storage capacity. The first is high surface area. Graphene’s unique structure, only one atom thick, means that each of its carbon atoms is exposed to the environment and, in turn, to the hydrogen gas. The second attribute is low density. Graphene has one of the highest surface area-per-unit masses in nature, far superior to even carbon nanotubes and fullerenes. The third attribute is favorable surface chemistry. After oxidizing graphite powder and mechanically grinding the resulting graphite oxide, Rafiee synthesized the graphene by thermal shock followed by annealing and exposure to argon plasma. These treatments play an important role in increasing the binding energy of hydrogen to the graphene surface at room temperature, as hydrogen tends to cluster and layer around carbon atoms. Rafiee joined Rensselaer in 2008, following an internship at the City University of Hong Kong and earning his bachelor’s and master’s degrees in mechanical and manufacturing engineering from the University of Tabriz in Iran. At Rensselaer, Rafiee and his brother, Mohammad, joined the research group of Mechanical, Aerospace, and Nuclear Engineering Professor Nikhil Koratkar. In his time at Rensselaer, Rafiee has authored five, and co-authored three, journal papers in various disciplines, ranging from materials science and mechanical engineering, to computer science and urology. Rafiee is from Tehran, Iran, and expects to earn his doctorate in 2011. Following graduation, he and his brother plan to start their own business with a focus on clean energy and green manufacturing.